Planning new samples is an ongoing task. I have a couple in the pipeline right now that are waiting on colors, so this weekend I played around with options. I narrowed down the group and then I let them sit. I checked in over the weekend, and I swapped out a couple. I've gone in a completely different color direction for one of the projects, and I woke up today ready to make final decisions. Sometimes it helps to let things marinate. In knitting . . .
My Lumos is growing. I transferred it to a longer needle, and now it can really breathe. 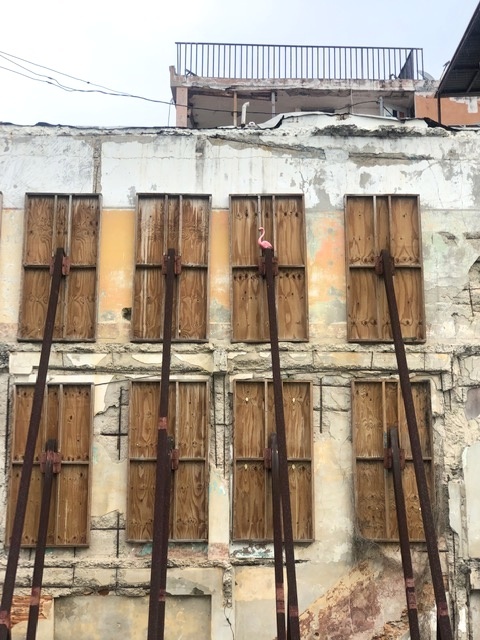 Progress all around. I'm starting to make inventory selections for my road trip next weekend. 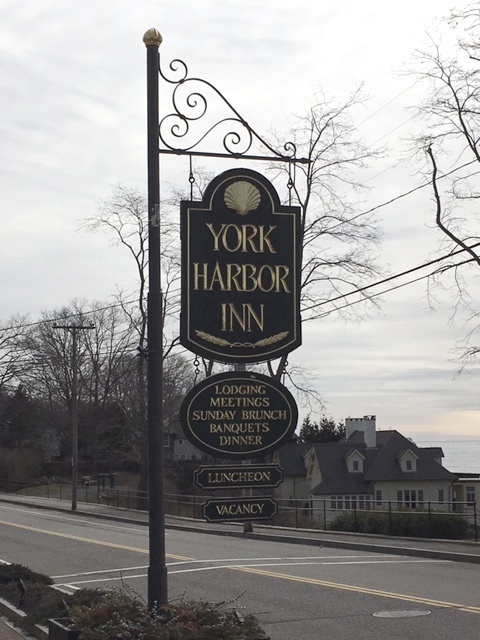 On Saturday, April 6, I'll be at the The York Harbor Inn for the Fiber Marketplace. 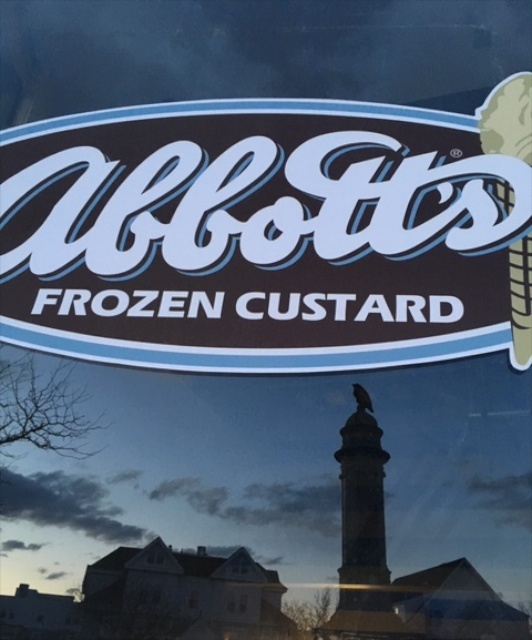 This one-day event features a mix of fun, creative vendors. Stop by if you're in the area. Follow the link for details. Yesterday was topsy turvy, and I ended up with a day off. Sort of. 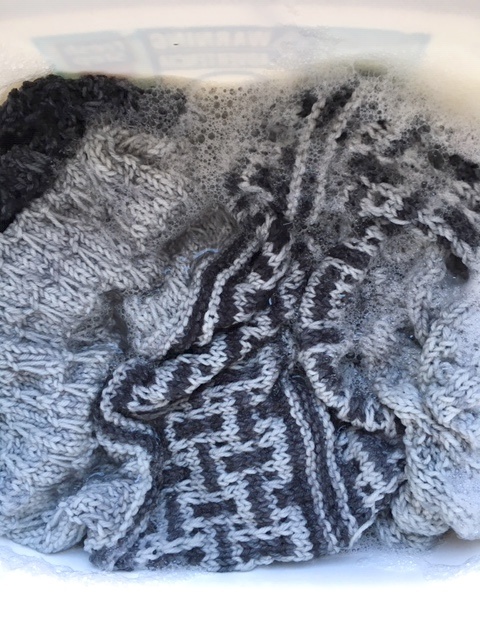 Instead of work with the dye pots, I had bonus knitting time. Lumos. 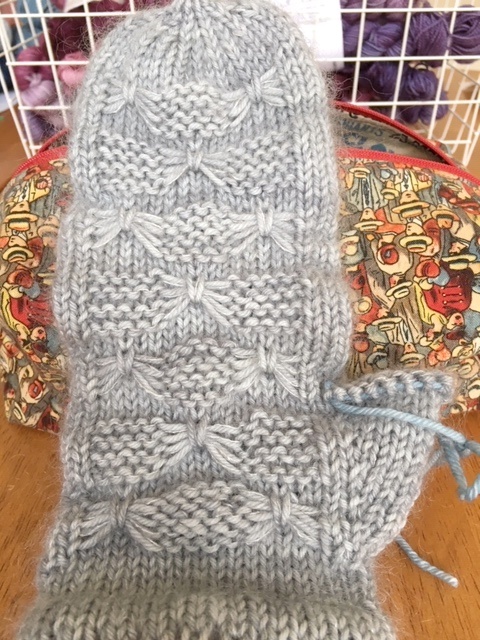 Garter with a simple repeat was just what I needed. This project is growing, and now I need a longer cable. The seasons are slowing shifting, and my window for working with mohair is closing. 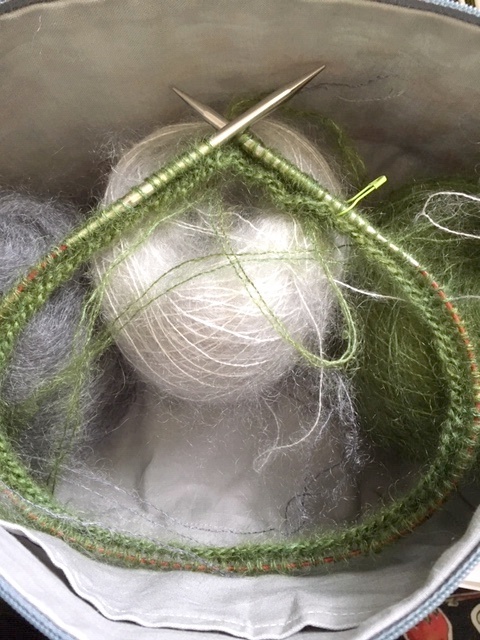 I knit all year long, but working with fuzzy yarn is not very appealing when it's hazy, hot and humid. 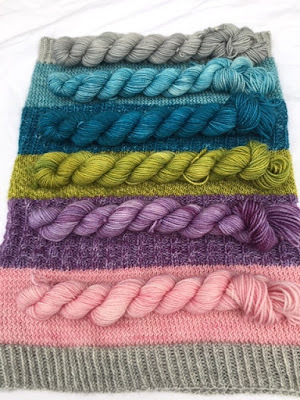 Simple garter bands alternating between two yarns, Lillian and Shimmer. While it's still cool, I'm going to keep the mohair moving. Lately I've been finishing projects at a pretty good clip, so over the weekend I cast on something new. The process of picking a project and choosing colors made me realize I need more than one new project. Or, more accurately, maybe I couldn't pick just one. 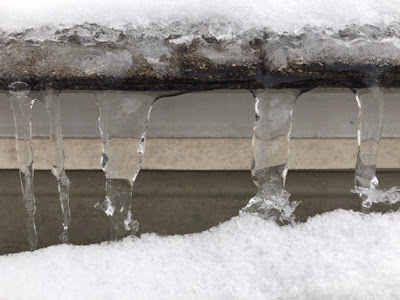 Sometimes it's a slippery slope, and right now I'm sliding. 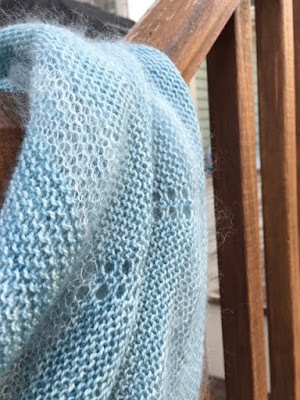 For the last couple days, my knitting has been all about mohair. I started a project and wasn't going to pick up anything else until it was finished. Ombre Cowl Hood. 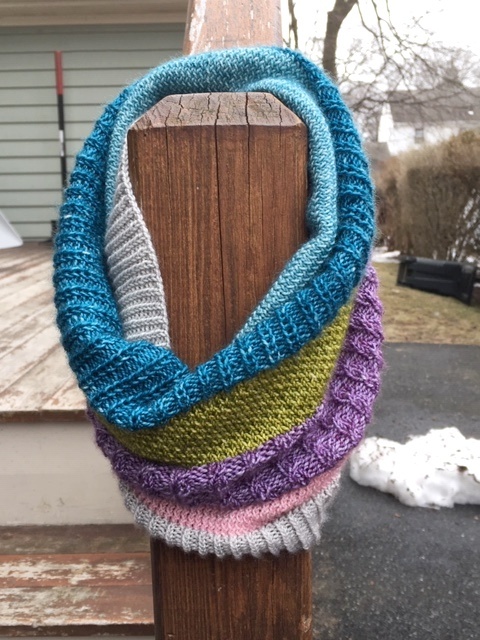 This project had been on my list for a while, but I was stuck on the colors. 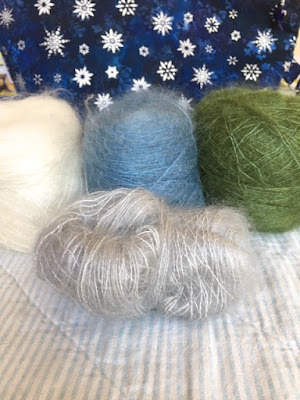 The other day I was looking at my pile of mohair and finally felt inspired to cast on. 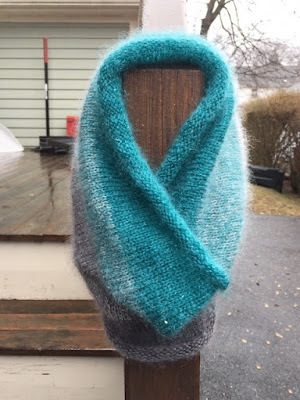 The mohair is a treat to work with, and the shifting colors add interest. 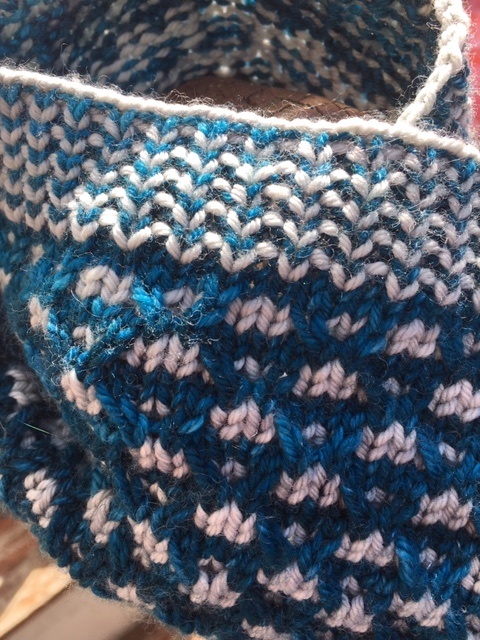 I knit this cowl in a meeting, at knit night and through numerous phone calls that put me on hold. I didn't have to think twice about what I was doing . . . such a relaxing project. The cowl is warm, cozy and light as a feather. The yarn is Shimmer in Pumice, March Sky and Juniper. 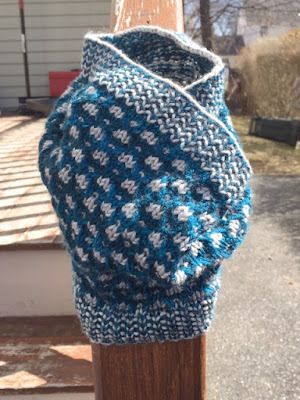 Since this cowl is a designated sample, I'm already planning another one just for me. I can't seem to shake the cowl bug. 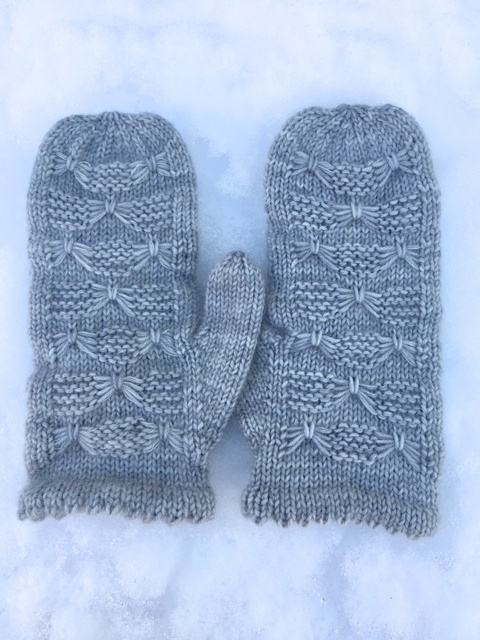 They are fun to plan, quick to knit and are off the needles in no time. 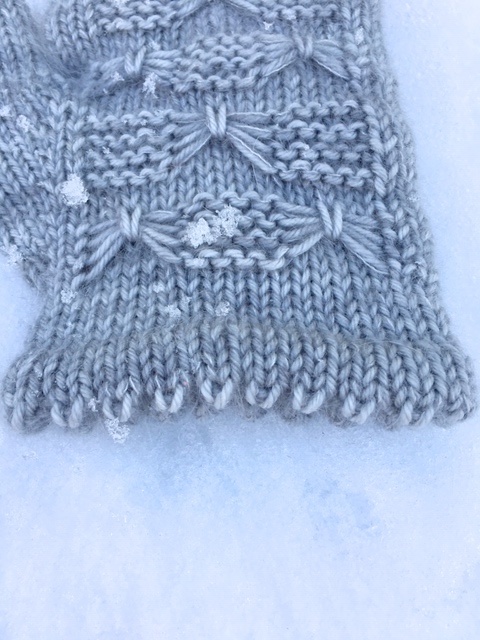 Ice Time Cowl. 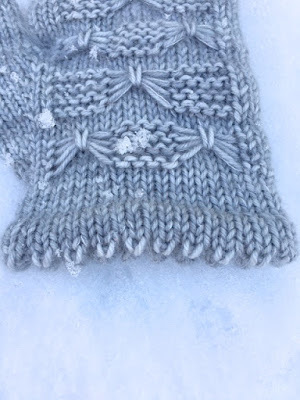 If you want a matching set, take a look at Ice Time Hat. This pattern has an interesting little repeat for two colors. Even the ribbing is colorful. 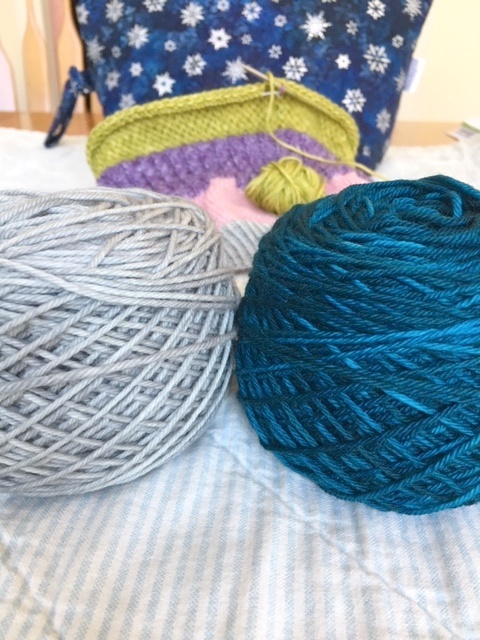 The yarn is Lucia DK, March Sky and Deep Sea. 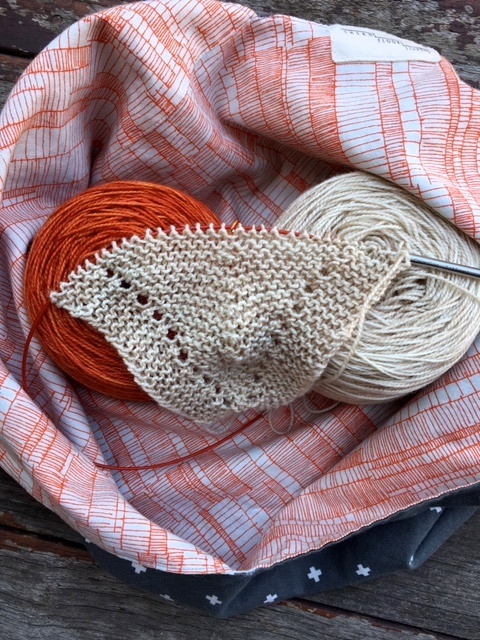 Yes, I already have another cowl on the needles, but I have other projects in the works too. I just need to pick the colors . . . Yesterday I stayed away from my computer, so today is all about catching up . . . scheduling, emails, orders. That's the price I pay for taking a day off. I've updated the schedule with spring shows. See the right sidebar. I'm still working on a couple other events. Stay tuned for details. I finished one project yesterday, and now I'm anxious to cast on something new. Maybe something with these stunning leftovers . . .
With spring heading our way, I thought it would be fun to have a fresh mini collection. Knitting at the Library Cowl. This pattern has a lot of built-in flexibility. Use as many colors as you'd like, make it as big as you need. 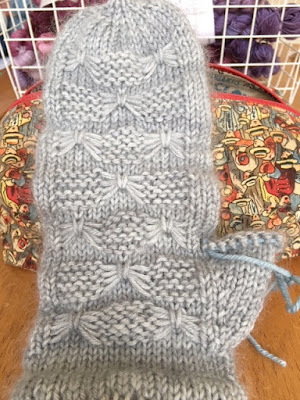 I worked Sections 1 through 4 and then repeated Section 1 before the final ribbing. 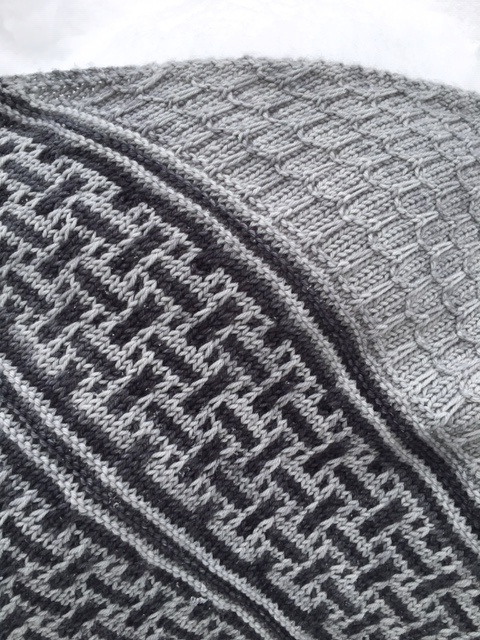 The stitch pattern variety creates interesting texture and contrasts. 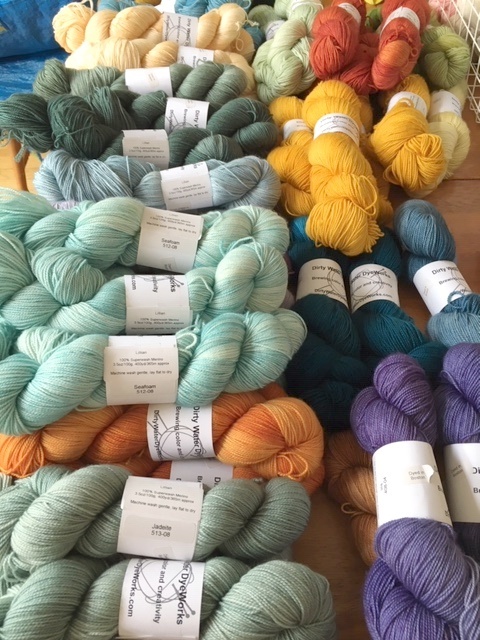 If you're out and about for the Knit North Yarn Crawl this weekend, on Saturday I'll have this sample and bundles at A Garden for Knitters. I have my daughter to thank for this week's color inspiration . . . a variation on Where's Waldo. It's only Wednesday, and it's been a busy week with show prep and general logistics. And then there's been knitting. I try to plan ahead with my knitting projects. 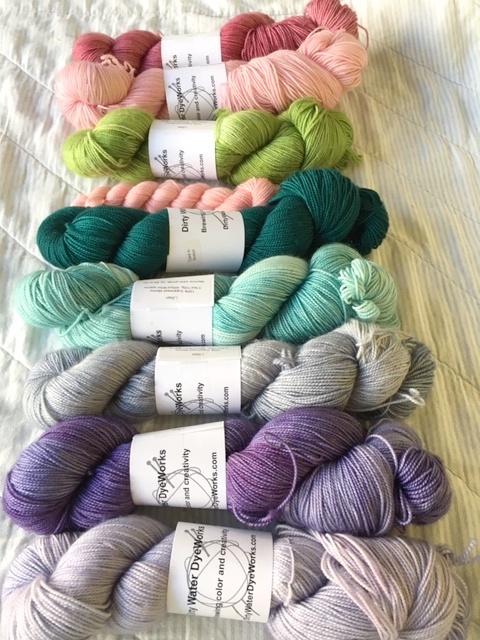 Since I'm getting ready to wrap up my current project, I lined up the yarn for the next one. There was some debate and back and forth about color choices. This combo wasn't in the running at first, but it'll do nicely. 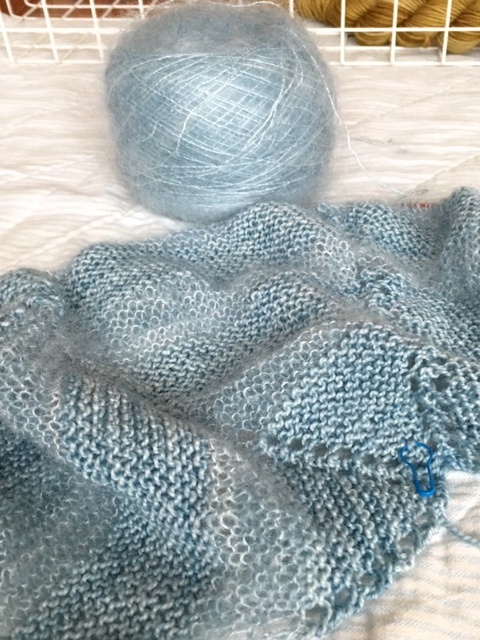 Now I'm ready to cast on as soon as I bind off . . . maybe even sooner. I've been playing around with mini bundles. Since I have a fresh color combination in production, it seemed like a good idea to highlight a new sample. Knitting at the Library Cowl. This project is all about texture, and I'm enjoying the variety. 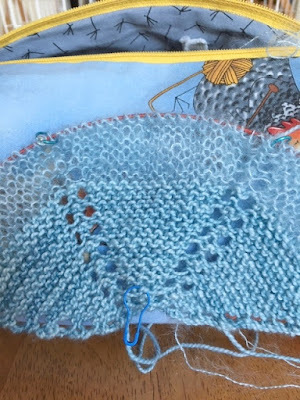 Finish one section, grab a new color and work the next section. This is my potato chip knitting. First a quick schedule update. 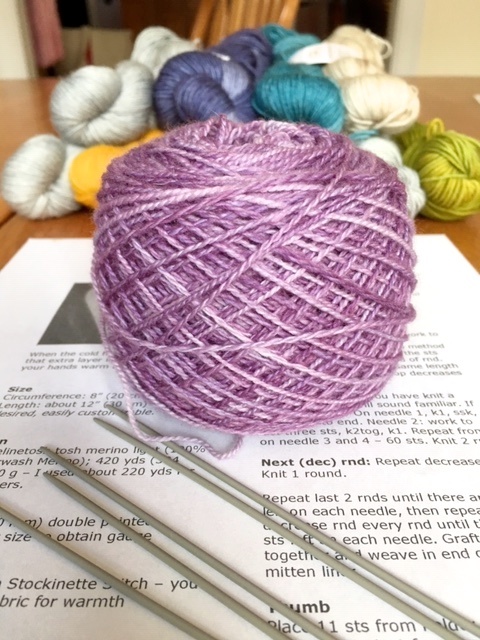 Next week is the Knit North Yarn Crawl, and on Saturday I'll be at A Garden For Knitters. I'll have a selection of yarn and various bundles. Stop by to see the shop exclusive design and kit. It's going to be fun! 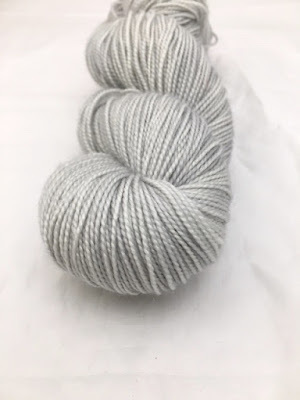 The other day I fell down the hole that is Ravelry and picked out a new project. After I made my decision, I realized I had to dye yarn for the new project. Not a problem - it just meant I couldn't cast on right away. 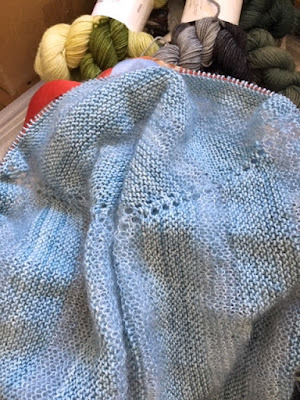 I had some knitting time while I was waiting for the yarn to dry, so I took a look at my projects already under construction. I don't have very many projects already on the go . 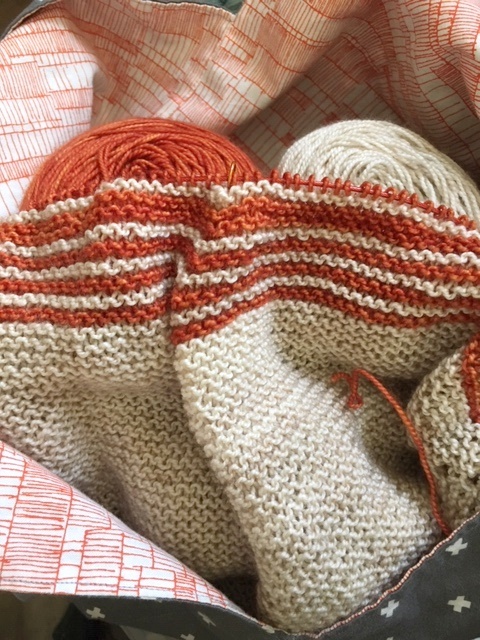 . . a couple socks and a cowl. I picked up the cowl and got busy. Garter Snake Cowl. I've been working on this brioche project off and on. I won't lie. 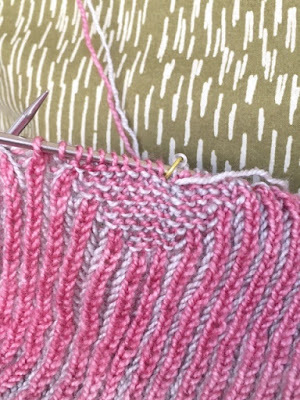 Brioche knitting is a slower process. 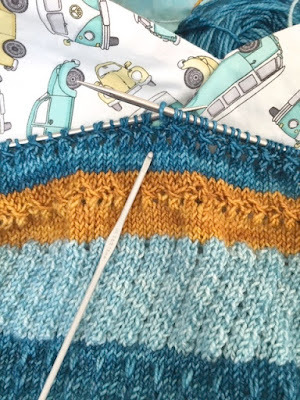 You only work half the stitches on any given round, so you have to work two rounds to work all the stitches. 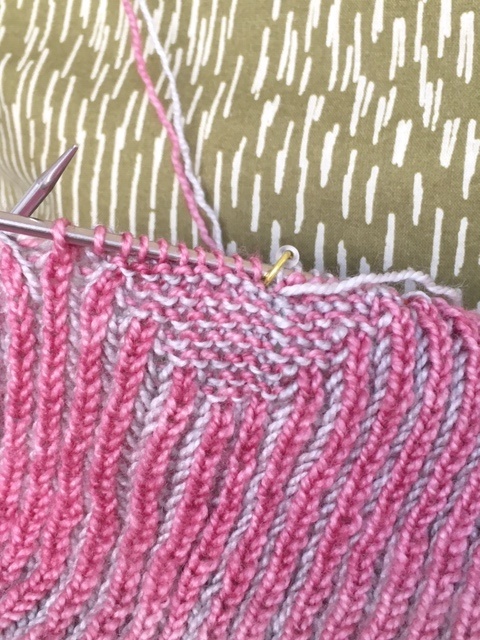 But there is a certain rhythm to brioche, and it can be very relaxing. 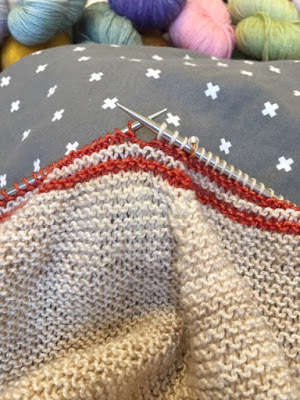 While I was waiting for the yarn to dry, I finished the first section and have moved on to the garter section. 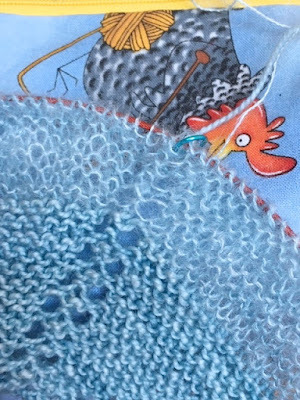 You can see a little bit of garter taking shape under the needle. Now that I'm seeing forward progress, it might be hard to put this project down. I'm still enjoying our winter weather . 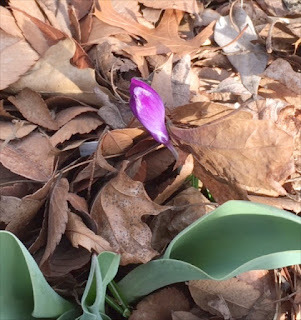 . . and this week's color inspiration. For once I have good timing. We're in the midst of a wintery week, and I have a fresh pair of mittens. 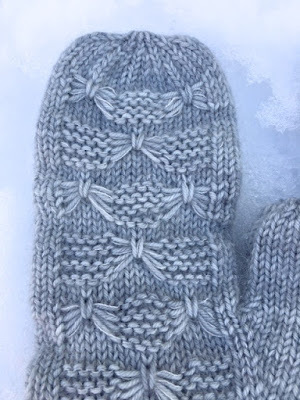 These mitts have some fun details. I made a couple slight modifications. I started with a provisional cast on. I prefer this method. When it was time to fold the hem, I took the waste yarn out to expose the live stitches and used those to complete the hem. 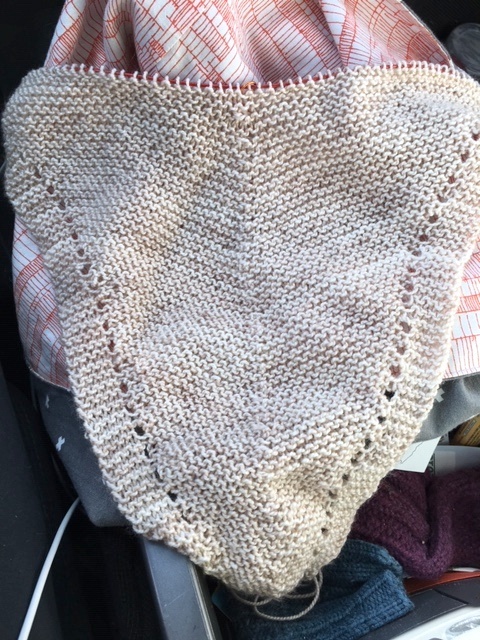 I used a smaller needle than the pattern calls for. 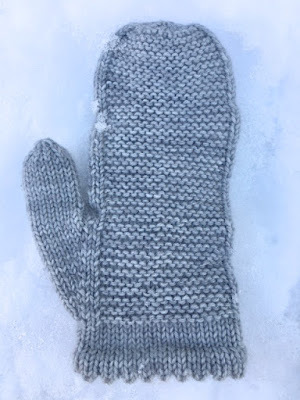 This created a denser fabric, but it also made the mittens a little shorter. 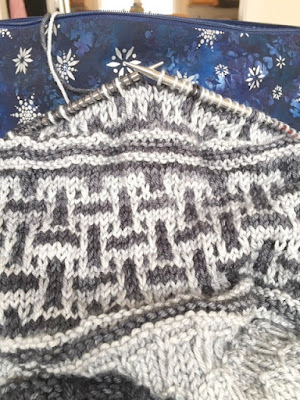 I added ten more rounds of the pattern repeat to make up the difference. With so much variety, these mittens are a fairly quick knit. 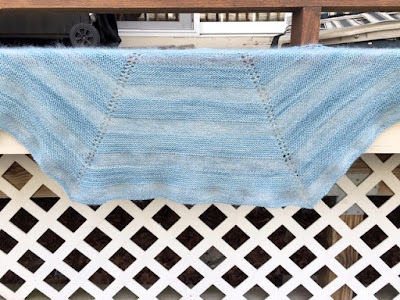 The yarn is Lucia DK held with Shimmer, both in March Sky. 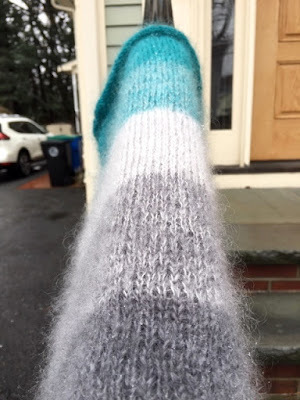 The Shimmer (mohair and silk) adds a nice soft halo and makes a warm, cozy pair of mittens. I had a great time yesterday at Farm Fiber Day. 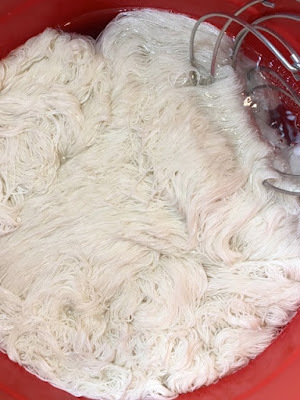 Isn't this fiber sculpture incredible? Thanks to everyone who came out. A winter storm moved in last night and left us with over a foot of fresh snow. My day is upside down due to cancelled plans and shoveling. I love the winter white so no complaints from me. 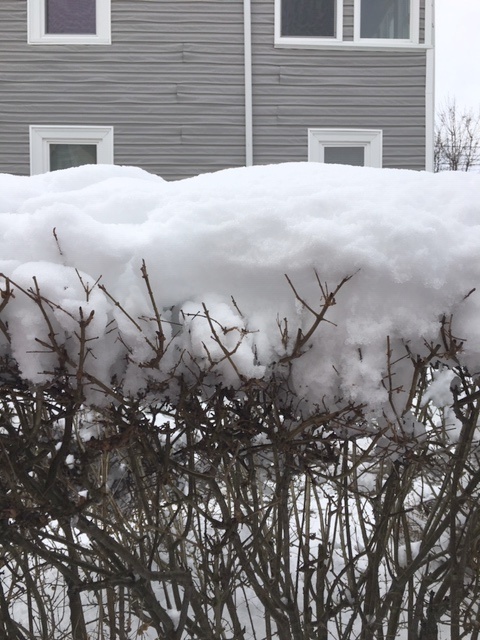 In keeping with the snow theme, here's Snowcastles on a fresh pile. 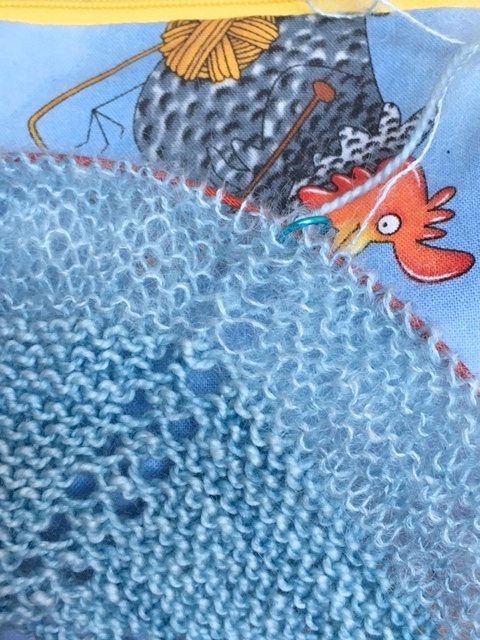 Slip stitches, texture, an interesting border . . . this design has plenty variety. 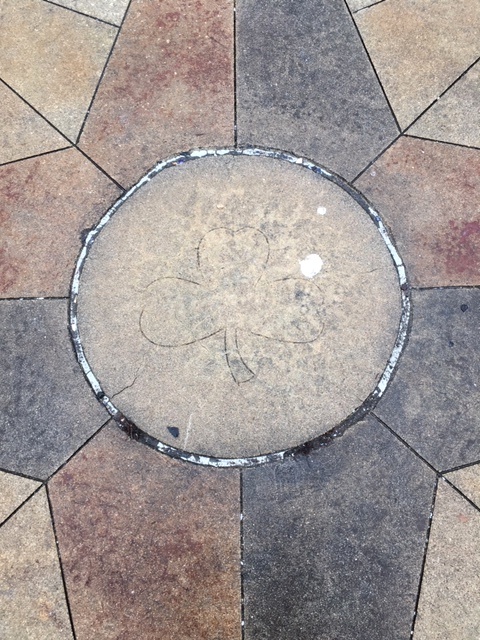 Contrasting colors highlight one section. 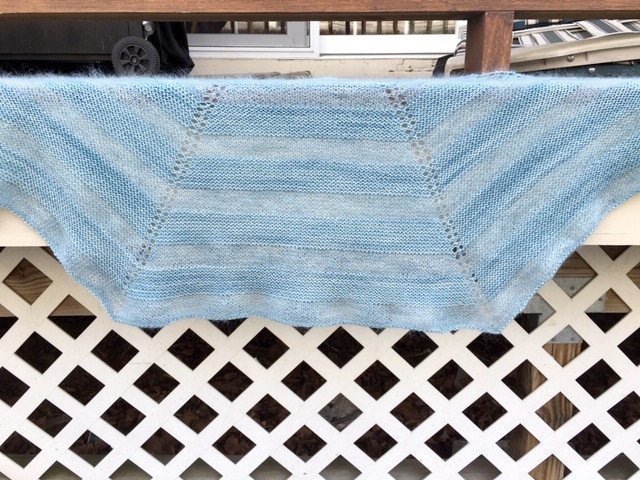 The yarn is Lucia DK in March Sky and Pumice. With that I'm off to have some fun in the snow. Happy snow day! Yesterday I was working away on my Snowcastles. Pick it up, put it down, pick it up. There was other work going on in the background, so I couldn't give it my undivided attention. 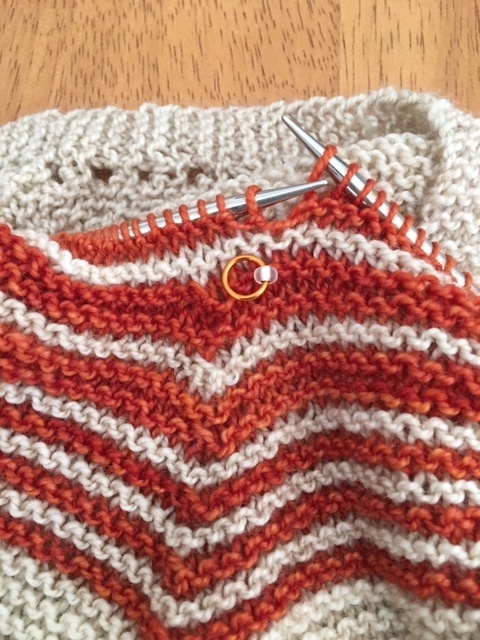 Last night while I was knitting, I realized I was closer to the end than I had thought. All that off and on knitting added up to real forward progress. That's the nudge I needed to focus on the finish line. 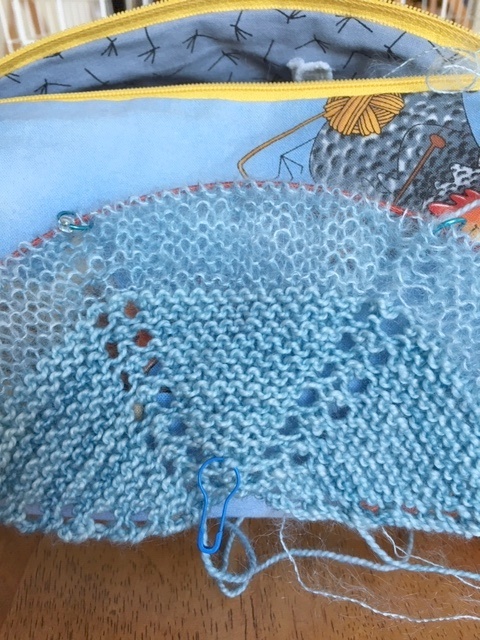 By the time I went to bed, this shawl was off the needles. 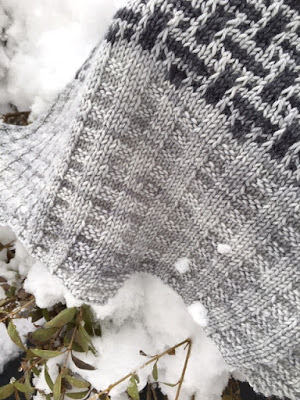 This morning I gave Snowcastles a nice bath, and as I write this it's blocking beautifully. If you're headed to Farm Fiber Day on Sunday, stop by. 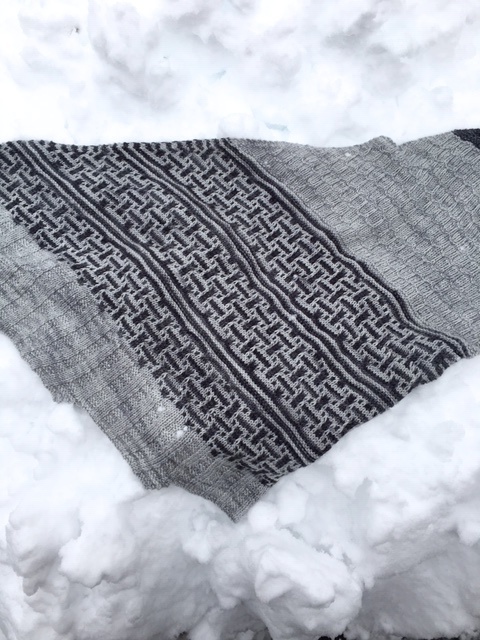 I'll have this shawl on display. 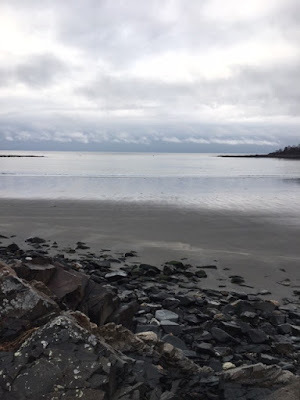 Our stormy weather pattern provided this week's color inspiration. It's only Wednesday, but if you're looking ahead to the weekend, Farm Fiber Day is this Sunday. The hours are 10:00-3:00. 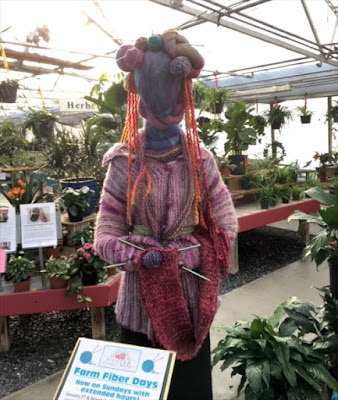 There will be a creative group of vendors on hand at Russell's Garden Center. Follow the link for a complete list. I'm juggling between a couple projects right now, but this one is getting a lot of attention. Gray on gray color play with Snowcastles. After a weekend with just the right mix of work and downtime, I'm feeling refreshed and inspired. Conversations about patterns and colors have given me a terrible case of startitis. I need to strike while the iron is hot, and this is just the first project. 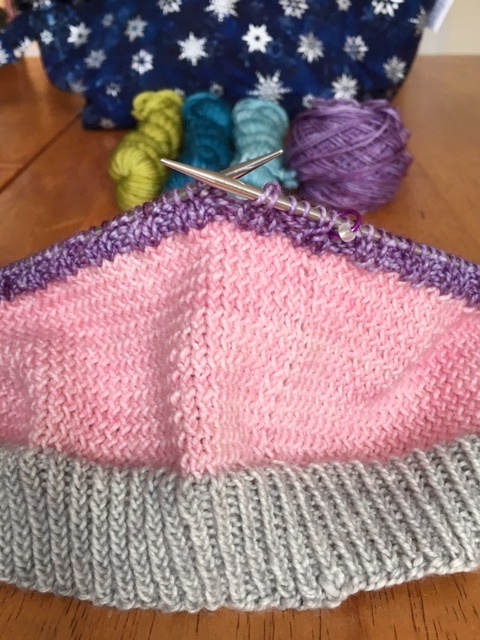 I would have cast on last night, but the needles were hiding. It was getting late anyway, so it's probably for the best. A new day, a new project. With one project off the needles and blocking, I've been able to concentrate on my Prairie Mittens. One done except for the thumb. I'm completely hooked on this pattern and would like nothing more than to sit and knit all day. I made it this far last night. 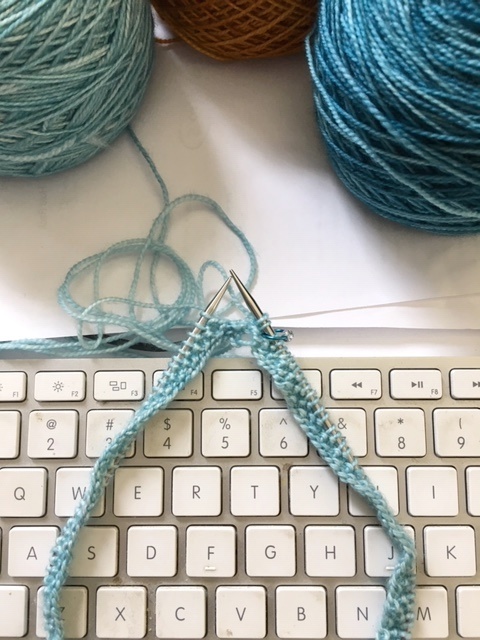 This morning I was ready to cast on the second mitt, but on second thought, I think I'll finish the thumb first. It won't take long. 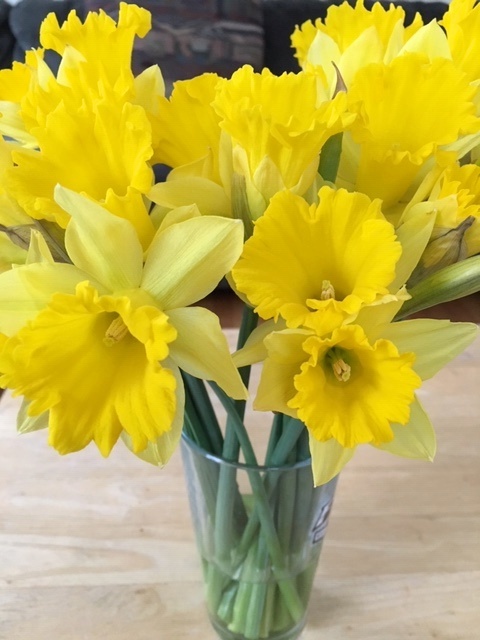 I love the gray of winter, but the other day I thought I would brighten things up. This week's color inspiration . . .